A delicious collection containing the perfect cheeses and accompaniments to be enjoyed during the Spring time. Fleur de Sologne 80g - A pretty soft French goats cheese with a natural rind and creamy delicate flavour. Lancashire Kirkhams 250g - Farmhouse Lancashire made using a traditional two day curd method. Open textured, buttery, hint of sharpness. Rollright 250g - Farmhouse washed rind cheese with a semi-soft, buttery texture & a blushing orange rind. Savoury and rich in flavour. Crozier Blue 250g - A creamy mild blue cheese with the distinctive sweetness of sheeps milk. Pear & Vanilla Confit 120g - The traditional flavour of pear with an added hint of vanilla is the perfect accompaniment to hard cheese. 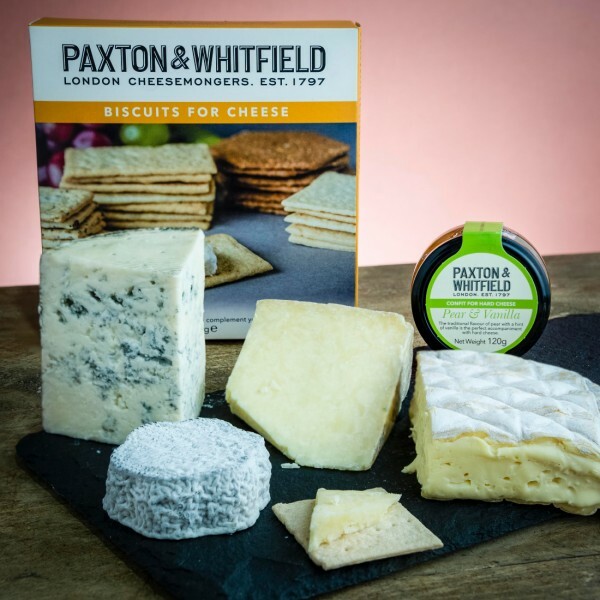 Biscuits for Cheese Selection Box 250g - A selection box of Biscuits for Cheese containing our Charcoal Crackers, Cornish Buttermilk Biscuits, Rosemary Wafers and Poppy & Linseed Crackers.